Following a stretch of four days off, the Colts will play back-to-back games Friday and Saturday night as they continue to push their way up the Eastern Conference. The team’s record is 27-16-0-2 where they have accumulated 56 points. They are currently first in the Central Division where they sit four points clear of the North Bay Battalion and the Niagara Ice Dogs. The Colts are still second in the Eastern Conference as Kingston holds the thrown as they have tallied 63 points. The Colts last played Sunday afternoon as they visited Mississauga to battle the Steelheads. The Colts would take the game 4-2 as Dylan Sadowy scored twice while Andrew Mangiapane and Justin Scott would also tickle the twine. Ruan Badenhorst stopped 24 of 26 shots to earn his 3rd victory of the season. Kevin Labanc still leads the OHL in points as he has recorded 29 goals and 55 assists for 84 points in 43 games. Labanc is one point ahead of London’s Christian Dvorak, who has 83 points on the year. Along with Labanc, Andrew Mangiapane has put together a solid campaign, registering 27 goals and 31 assists. His 58 points place him tied for 10th in league scoring with Kitchener’s Ryan MacInnis. Mangiapane has been on a roll of late as he has put together a 12 game point streak that’s seen him record 11 goals and 12 assists, including goals in his last five games. Another Colt who has made an immediate impact is Dylan Sadowy. Since joining the Colts, Sadowy has recorded 8 goals and an assist in 6 games. Like Mangiapane, Sadowy has also notched a goal in Barrie’s last five games. Rasmus Andersson continues his productive season as the Flames prospect leads all defensemen in scoring with 43 points in 43 games. 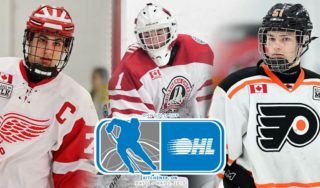 The Colts will take on the reigning memorial cup champion Oshawa Generals in Oshawa Friday night as the two teams will meet for the second time this season. Their first meeting took place in Oshawa back on October 25th where the Colts came away with a 5-3 victory. Barrie took a 3-0 lead going into the second after a pair of goals from Andrew Mangiapane and another from Zachary Magwood. The Generals would come within a goal at Matt Mistele scored late in the third to make it 4-3. However, the Colts would ice the game as Mangiapane would fire one into the empty for the hat-trick. Julius Nattinen had three assists in the game while Kevin Labanc and Roy Radke each added two points as Labanc added a goal and an assist while Radke recorded two helpers. Mackenzie Blackwood stopped 38 of 41 shots to record the win as he was named the game’s first star. Through 46 games, Oshawa has a record of 17-23-3-3 and sit 4th in the East Division. The Generals are clinging to a playoff spot as they currently 8th in the Eastern Conference with Hamilton just two points behind them. Oshawa’s powerplay ranks 11th in the league, working at an 18.9% effectiveness while the penalty kill hasn’t fared too well, ranking 17th operating at a 77.2% success rate. Anthony Cirelli leads the Generals in points as the 3rd round pick of the Tampa Bay Lightning has amassed 12 goals and 23 assists in 41 games. Cirelli is widely remembered for scoring twice in the Memorial Cup final including the overtime winner as he gave Oshawa their 5th Memorial Cup in team history. Domenic Commisso has been Oshawa’s top rookie as the native of Oakville has recorded 13 goals and 19 assists in 44 games. His 32 points rank him 7th in the OHL in rookie scoring. Jeremy Brodeur, the son of NHL legend Martin Brodeur, has been Oshawa’s primary starter as he’s posted a record of 16-14-2-2. His 5 shutouts ranks second in the league behind only Mississauga’s Jack Flinn. Following their game in Oshawa, the Colts will travel back to the Barrie Molson Centre to square off in a Central Division showdown with the Niagara Ice Dogs. This will mark the 5th meeting between the Colts and Ice Dogs with the season series split 2-2. 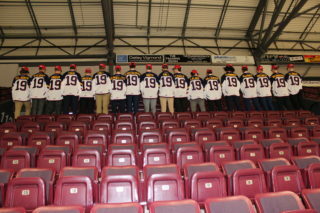 The two teams last played on December 28th where the Colts edged Niagara in a shootout 5-4. Trailing 4-3, Kevin Labanc would tie the game up with 51 seconds left in the third before Andrew Mangiapane would score the lone shootout goal to give Barrie the win. Labanc finished the game with 2 goals and an assist while Justin Scott added a goal and 2 assists in the win. Through 44 games this season, the Ice Dogs have a record of 23-15-3-3 and sit tied for second in the Central Division with North Bay, sitting 4 points back of Barrie for the Division lead. Niagara’s powerplay ranks 6th in the OHL at 20.8% while the penalty kill ranks tied for 6th as they have killed off 83.1% of their opportunities. Josh Ho-Sang leads the Ice Dogs in points as the New York Islander prospect has registered 14 goals and 41 assists in 42 games. His 55 points ranks him 16th in OHL scoring. Ho-Sang is tied with London’s Christian Dvorak for the third longest point streak of the season. Ho-Sang’s started back on October 18th and finished nearly two months later on December 8th, a span of 19 games where he recorded 8 goals and 20 assists. Jordan Maletta leads Niagara in goals with 27 and ranks tied for 8th in the OHL with Andrew Mangiapane and London’s duo of Mitch Marner and Aaron Berisha. Vince Dunn has been Niagara’s defensive leader as the St. Louis Blues’ prospect has tallied 10 goals and 23 assists in 38 games. His 33 points ranks 5th in scoring amongst defencemen. Niagara’s recent success may be the most accredited to goaltender Alex Nedeljkovic. Since being acquiring from the Firebirds, Nedeljkovic has a record of 6-3-0-1 with a 2.19 GAA and a .924 save percentage. Nedeljkovic was the United States’ starting goaltender at the World Juniors, where he helped lead the team to a bronze medal.